In fall you need ankle boots. We all know that right? I bought my dream pair of ankle boots in a sale two years ago, but after the snowy winters of ’11 and ’12 they are completely ruined. This year, I should remember to clean up my shoes after walking the salt-covered streets. Actually, most of my shoes are in a bad shape and that’s why I’ve teamed up with Spartoo this winter. Spartoo is an online shoe retailer offering lots of different brands on just one website and was so gentle to offer their help in my personal color challenge. I originally challenged myself to wear more color, but since my black boots are is such awful condition, I decided it would be best to get my basic shoes ready before I start with something more daring for me. While going through all the black ankle boots, I noticed I was mostly draw to either western-inspired booties like the Refresh boots and the Clarks’ above. I do feel like they have a quite defined style though, and knowing myself well it’s probably better if I go with a more basic pair like the ones from Pare Gabia or Jonak. I already have a pair of Jonak ankle booties and love their quality and fit. So now I’m really torn between these four options. Should I stick with a basic model, or should I go west? I think #4 would look lovely on you! Dat tweede laarsje ziet er mooi uit! Nr 4 is echt mooi! Personally i like #2 the best. But i tend to lean tward the statement pieces. I like option 2 and 3 the best! I'm a big fan of #1 and #4! I wnat number two and four for the coming season. I have no clue how any of these are Western inspired, but I like 2 the best. four has that fun detail of the silver tipped (which to me looks more Western than anything else). all of these are amazing… get them all! hehe jk… well sort of. I love the 3rd style! Number 1! Have you looked into water proofing your leather? Whenever I get a good pair of leather shoes, I spray them to protect them from the elements. Your local shoe repair shop should have something. I'm in love with the first pair, but I have much more classic style so I'm a bit biased! They are all beautiful booties. Definitely going to check out this site!! Pfff… I always like the most expensive! The first one is gorgeous! nummer vier is heel erg leuk! Nummer 1 en 2 zijn mijn favorieten maar vooral nummer 2!!!!!!!!!!!!!!!!!!!! Jonak Jonak Jonak! Die staan ook op mijn wishlist! 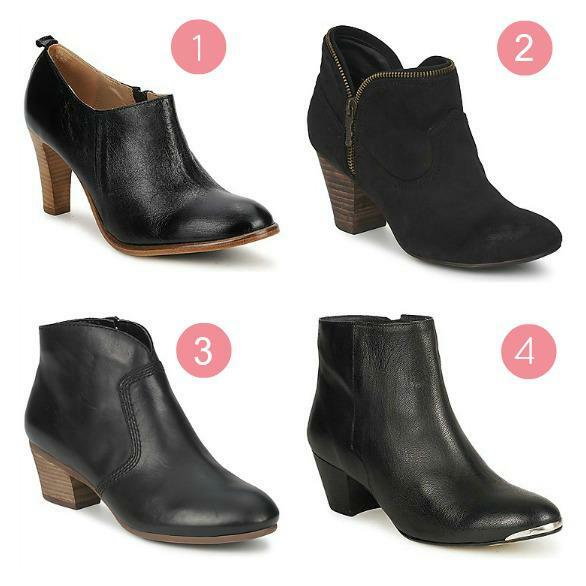 #2 is definitely my favorite but that's because I'm drawn to suede booties. I just bought my first pair in taupe and LOVE them. Black is next on my list. I bought a pair similar to #1 but had to return them because they scraped against my ankle bone and hurt so much. Just be careful with boots that low!